the ATMs for Good® program. Do you want to sponsor an ATM for Good? It can bring an organization $1,000 a year! Please contact Erin@griffinsguardians.org if your business is interested in giving back to the community with an ATM for Good. at the Cicero Twin Ice Rinks! Griffin's Guardians is a member of the ATMs for Good® program launched by Syracuse ATM. What this means is that we are sponsored with an ATM placed in a location that chooses to work with us as a nonprofit, and Griffin's Guardians automatically receives a portion of each and every surcharge as a donation! On top of that, we also will gain exposure through advertising on the ATM's screen and by a custom ATM wrap, sporting the Griffin's Guardians logo and message. How you can help: Network, network, network. Are you tight with the owners of any locations that need an ATM? Do you know anyone that is passionate about this cause and could use an ATM, or a replacement ATM? Keep your eyes peeled, and keep this in the back of your mind. The more ATMs we have supporting Griffin's Guardians, the more good we can do. ATMs for Good® is a program in which Syracuse ATM works with local nonprofit agencies to place branded ATMs in local businesses, with a portion of the surcharge being donated to the nonprofit. The ATMs will be wrapped, showcasing either the nonprofit or the ATMs for Good® program, and custom screens will be designed to inform the ATM users of the sponsored nonprofit’s mission. Every time a surcharge transaction takes place, a portion of that surcharge will automatically be deposited into the nonprofit's account. 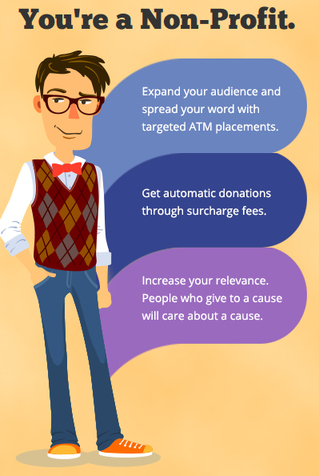 ATMs for Good® allows a nonprofit to gain immediate relevance. An individual that gives to a cause is compelled to become invested and involved in that cause. ATMs for Good® allows nonprofits the ability to take up mindspace within an individual that may not have even been aware that the nonprofit existed. A “we” mentality is created. The program removes the barrier of “us” (the ATM user) and “them” (the nonprofit). By automatically contributing to the nonprofit, each user is now a “we” with the nonprofit. This becomes more than just monetary donations, but donations of time, materials, and manpower as well. ATMs for Good® is an opportunity to have unique targeted advertising. The ATM wrap can be thought of as a billboard that collects donations. Every patron of the location where the ATMs for Good® ATM is placed will see the message it conveys. This program targets not only the ATM users, but all the traffic in particular location. Having an ATM branded with the nonprofit's message allows the nonprofit to spread awareness and incite involvement. A unique aspect of ATMs for Good® is that donations are not optional. The user does not choose whether or not to donate -- it is a predetermined conclusion. This is a fee users would pay regardless, but now they can feel better about it, knowing that a worthwhile organization is the beneficiary, and not some greedy corporate entity. The nonprofit makes money through this ATM on a per transaction basis -- it is not dependent on the whim of the ATM users. This means guaranteed revenue to the nonprofit, from a source otherwise untapped. It is similar to crowd-sourcing for a non-profit. A small donation from many of individuals can add up to a lot. Add to that the personal connections being made, and this program is a win-win for nonprofits.